The location of this project is the backyard of the Heffernan House (HH). 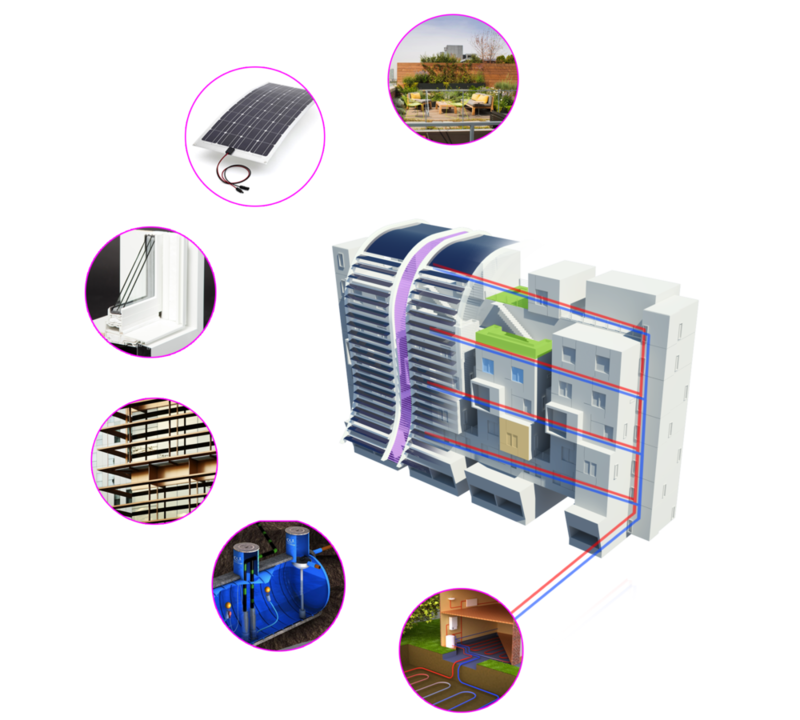 The design of the housing centered around two primary constraints: the size of the lot and the need for solar energy. With the need of two egress stairs and an elevator, the location of the vertical circulation became critical. By locating the stairs at the corners, and variegating the upward trajectory, students would be more inclined to use the staircases over the elevator, and thus interact beyond a floor by floor basis. As an example to future housing the building was designed to be zero energy, with solar panels on the roof angled at 30 degrees to maximize solar gain. The amount of conditioned space and glazing has been limited to reduce the consumption/loss of energy. 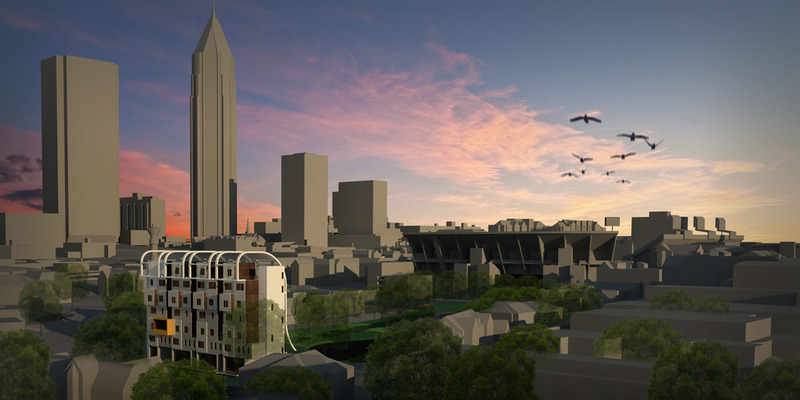 This proposal located in Tech Square imagines the reclamation of residual space for housing within the urban realm. Parking accounts for a vast majority of our built environment. Cities can maximize the performance of these residual spaces by repurposing parking decks for social, environmental and housing applications. This transformation of residual space lets the parking deck function as normal with additional housing while also allowing for electricity generation to serve Tech Square at large. Inspired by the southern vernacular Dogtrot house, the Bauer-Winston Learning Community utilizes passive strategies to reduce energy consumption, while emphasizing living with the landscape. This specialized environment is catered toward majors associated with the biological sciences, but encourages interdisciplinary study among all students. This community employs the campus as a pedagogical tool for learning. Activating the building and its surroundings as a learning tool not only immerses the students in their chosen field, but emphasizes the importance of cohesive and sustainable living with the natural environment. 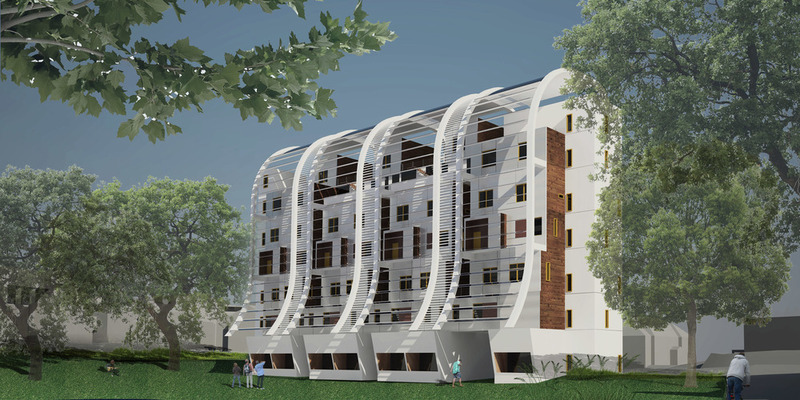 Flexibility and versatility are a necessity in student housing. With the ability to reinvent a space through movable panels, transformable furniture, and sliding doors, spaces that were once single purpose rooms now have new life as multi-functioning volumes. This combination of design and user input is primed to foster collaboration and community development. This type of flexibility also allows for activities to be scaled by privacy. Students may choose to study alone, or in a group by simply adjusting their space. The breezeways of the building are used as connective tissue, allowing for flexible common space to move throughout the building with the option to open and close as needed. 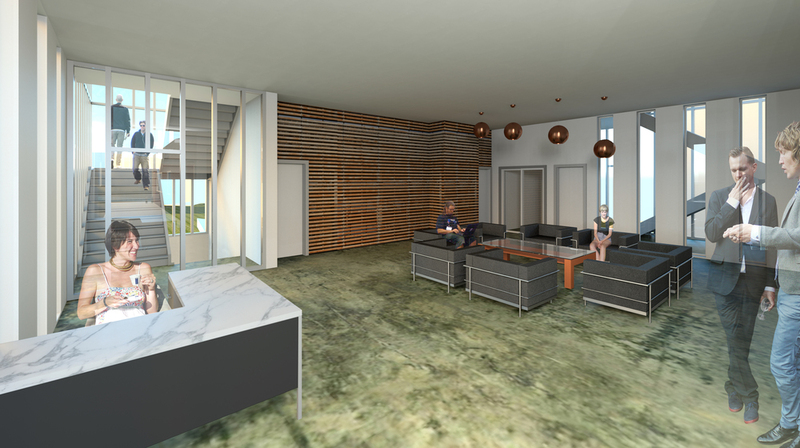 The Bauer-Winston Learning Community allows students to customize the spaces of their built environment, while maximizing interaction and learning within the natural environment of campus. The eco commons are a set of water features planned for the Georgia Tech campus which will infiltrate most of the campus’ runoff in a parklike setting. Buildings on the eco-commons should be a part of the landscape. 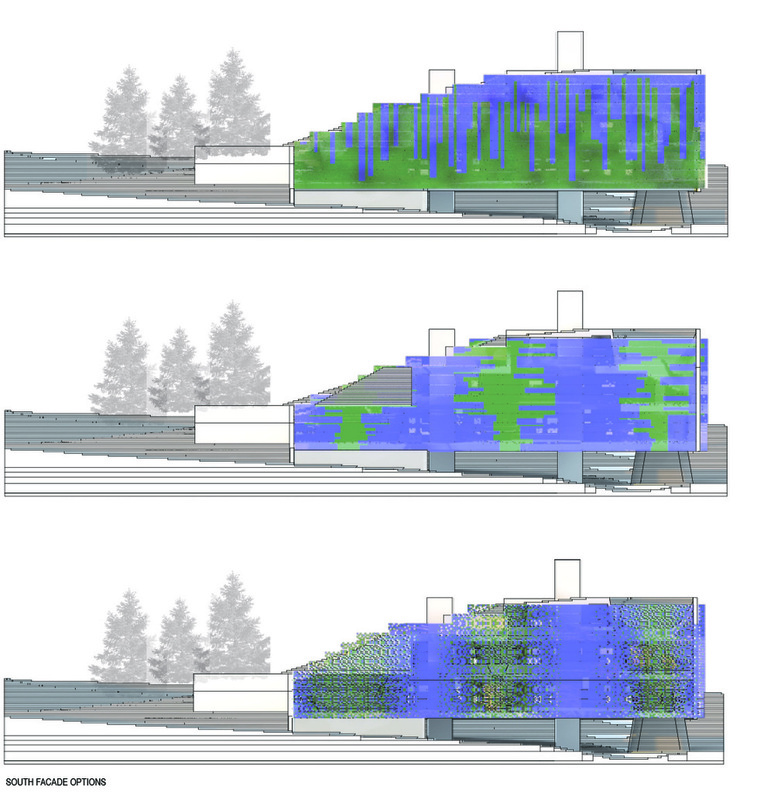 This project cleans and treats water for release ino the environment, but it does so in a way that is consistent with the goals of the eco-commons; it puts the systems on display for an enriching experience. The building will feature a “cool hearth” underneath, with wind shade and evaporative cooling making a comfortable micro-climate. 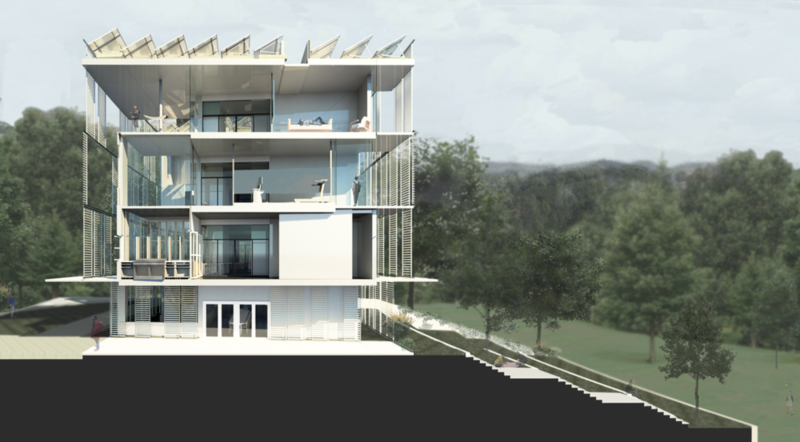 The building will also make use of available energy on the site with a southern facade shaped to catch the sun for photovoltaics and algae bioreactors. Finally, the building will be partially underground to take advantage of the steadier temperatures of earth. While achieving all of this, the building will do something experientially special: it will force students and faculty to walk through and learn from a landscape that only gradually becomes building. Situated on the northern edge of Georgia Institute of Technology, the 10th + State Street site functions as a secondary entrance to the campus. Opposite the faster-paced 10th Street edge is a community of single-family and multi-family homes. As such, the site and programmatic definition provides an opportunity to create a transition between these two distinct groups. 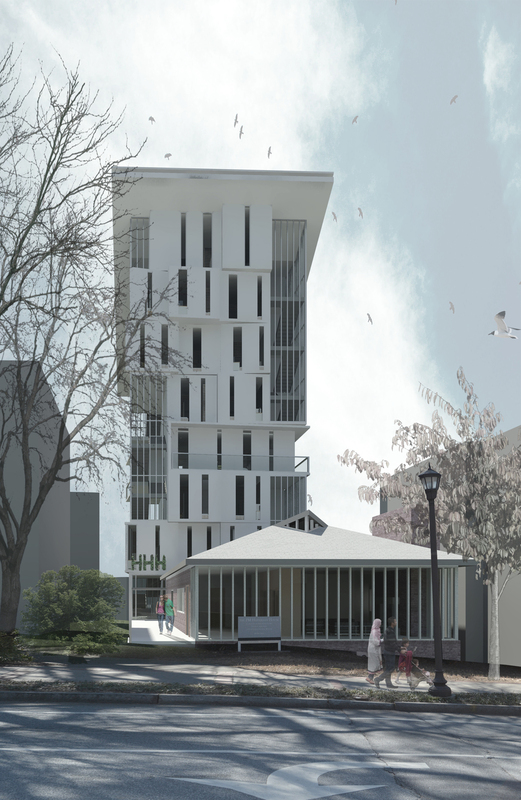 Keeping in mind the intention of sustainable practices within a living + learning community, the orientation and site strategies keep in mind the integration of communal amenities and opportunity for connections between the community, institute and buildings. The faster-paced 10th Street edge condition is developed with a pedestrian setback an architecturally defined edge to provide distinction between active transitions and more passive experiences into and around the building. In contrast to 10th Street, State Street functions as a slower-paced point of access driven by heavy pedestrian foot-traffic. The negotiation of this edge seeks to mimic the new Engineered Biosystems Building (EBB) to the west with a play on hard and soft edges. Working to embody Daniel Matisoff’s idea of a living + learning community focused on sustainability, the program is structured with these key ideas in mind. A student would enter the program and housing system as either a freshman or sophomore and work within a small community of similar students on group projects and course-work to develop greater understanding of sustainable systems. Each year of enrollment thereafter would be motivated by more autonomous work either within the building, the institute or the community. 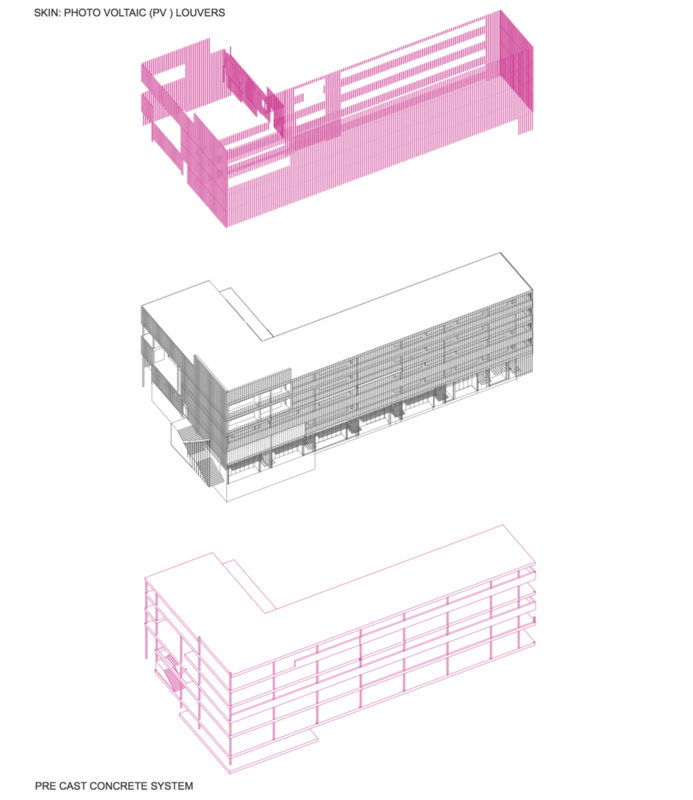 The idea of growing autonomy is represented through the building’s programmatic definition - specifically through the available unit-types and communal spaces: each student would be provided a unit with varying degrees of amenities. As he/she advances through the program, the opportunity for more privatized living quarters is provided while younger students are supplied with communal spaces. Situated along Georgia Tech’s future Eco-Commons on Ferst Drive and Hemphill Avenue lies the Georgia Tech Living Learning Community. 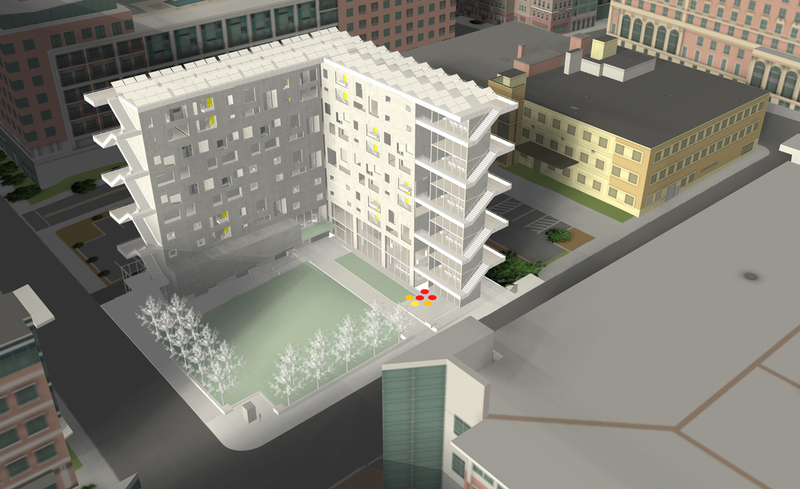 With on-campus housing becoming less of a necessity for students, a new typology must be invented. The future of collegiate living is for students seeking an immersive educational experience in a rich spatial environment. Students will have control over the lighting and lifestyle conditions: flexible spaces to convert and inhabit; smaller communities within the building for support, advanced technology to support and showcase their works. Collaborative space is the central idea of this building; supporting and creating informal spaces for the users to interact with one another. The building allows for public access to the completely open ground floor, while students have their own entrance and secured space in the floors above. A series of sustainable techniques were employed in an effort to both reduce the amount of energy consumed by the building and increase the amount of energy created by the building. Some of these sustainable strategies included the use of solar panels on the roof, shadovoltaic glass louvers on the east and west facades, triple glazing, cool roofs in areas without solar arrays, automatic daylighting systems, and a myriad of solar shading devices. Through the calculated and meticulous use of these strategies, the project boasts energy loads that are significantly lower than comparable buildings in the same region. In addition, the project creates significant amount of renewable energy to supplement the energy burden that the project has on the grid. The current Peter’s Parking Deck is located at low ground level area, and on a day with heavy rain, rainwater drainage is a critical concern to parking deck users. The hideous concrete parking deck makes the area unpleasant. The proposal is to tear down the existing parking deck and transform it into “Peter’s Park” for promoting car-free living and a healthier environment. Off-site construction will save time and costs for this project. Modularized units will be prefabricated in a factory and transported to the site. This proposal seeks to tackle four goals which are: To create a formal gateway into Tech Campus; to bridge the connection between the public, the on campus community, and the Home Park community; to foster an active learning environment that addresses sustainability with the collaboration of faculty and students alike and; to address safety and community engagement in the area. West Gateway Residence Hall is situated at the corner of Northside Drive and 10th Street NW in Atlanta, GA. This site is not only a part of the Georgia Tech campus community but also a part of Home Park and West Midtown communities. 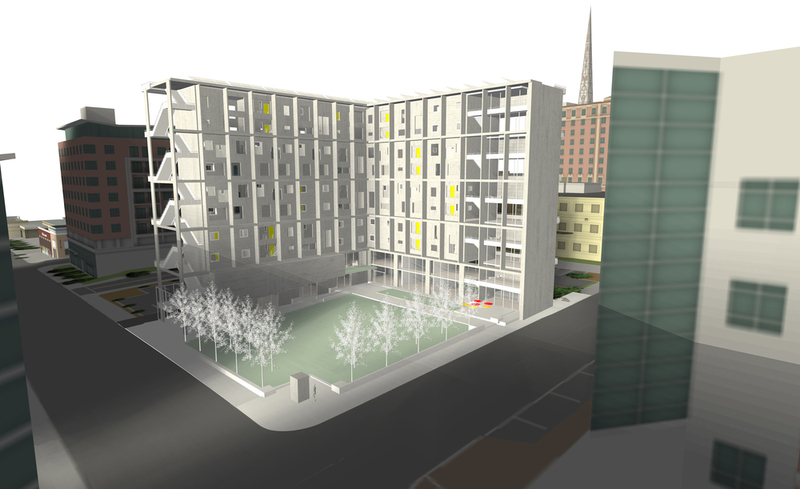 West Gateway Residence Hall provides a mix of ground floor retail, learning facilities, compact residential units, and community building spaces. This project proposes a new mixed-use building for Georgia Tech consisting of residences, retail space, classrooms, media labs, a library annex, and auditorium space in the heart of Tech Square, advancing the Institute’s presence in Midtown and connection to the Atlanta community and providing students with an exciting place to live and learn. 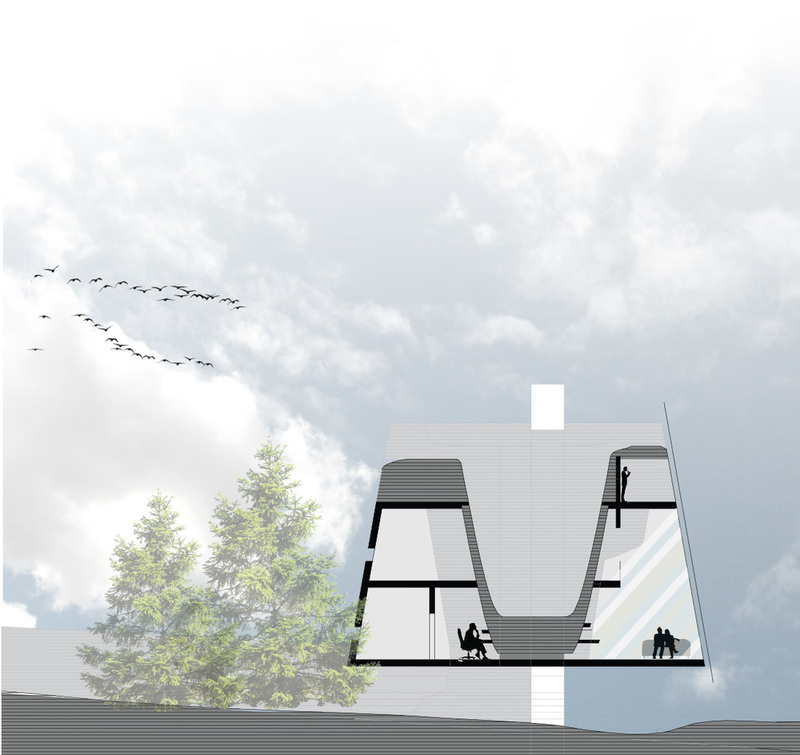 The architectural concept has three main goals: (1) to promote sustainable development by offsetting all used energy with renewable solar energy; (2) to create light-filled units that provide indoor and outdoor private and semi-public spaces for students to study, meet, and interact; and (3) to provide for future expansion through modular pre-fabricated construction with the potential of doubling the student population and academic spaces while maintaining net-zero energy consumption as solar power technology rapidly improves.